Welcome to the Lakes Martial Arts blog where you can keep up the latest happenings in our Minneapolis martial arts program. We'd love to hear from you, so feel free to toss a comment in the blog! BRUCE LEE ONCE SAID "A GOAL IS NOT ALWAYS MEANT TO BE REACHED; IT OFTEN SERVES SIMPLY AS SOMETHING TO AIM FOR." Have you always wanted to do something but never did... like earn a black belt, place in a big tournament, or go for that big job promotion? When you try, do you sometimes fail? We all share these common fears! That's good news! Goals can also be thought of as dreams with a deadline. Sure, it is easy to set a goal. And it might be easy to share your goal. But when you put a date on the goal, you add a level of accountability to yourself. 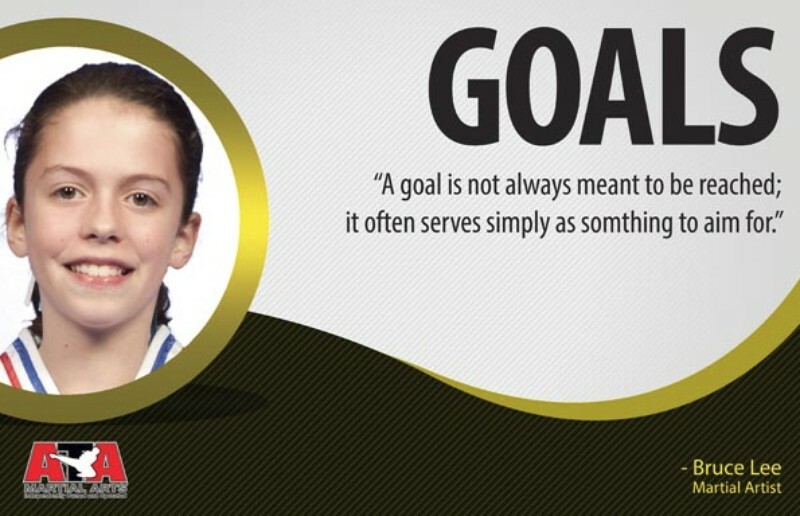 Hopefully, too, by sharing your goals others can help you obtain them! My goals for Lakes Martial Arts for this session is to have 90% of my students test for their next belt on April 17. That's going to be a ton of work, but I know the students (and parents) will love the results! With the tournament on March 30, we will have lots to look forward to! Beginners >> Sohngham 3 Tiny Tigers do first half of form (moves 1-14) and one-step #1. Karate Kids complete entire form and both one-steps. Intermediate & Advanced >> In Wha 2. Karate Kids and adults must complete entire form (beginners must also demonstrate both one-steps). Parent Stripe Sheet (Goals) >> Students must work on specifics goals for 3 weeks to earn gold stripe on their belt. Smart Sheet info >> Just in case parents would like to continue this. *** Testing will be held on April 17 at 6pm at the Pershing Recreation Center. There will be no classes on April 24. To help prepare for the tournament, we will have a FREE tournament prep class on Saturday, March 23 from 1 - 3pm at Pershing Park. Students are highly recommended to attend. Doesn't always dress as Elvis while photographic a wedding. Makes art with animals. Goats and sheep mostly. Bruce Lee once said: “As you think, so shall you become.” This is true for much in life… doing well in school, exceeding in the workplace, or competing at a tournament. It is all about attitude! “The attitude I choose impacts others,” reminds us of the importance of a SUPER FANTASTIC attitude. After all, attitudes are contagious. Of all things in life we can't control of, there is one thing we CAN control: OUR ATTITUDE! Attitude is rooted in confidence and faith in your ability to do your best. We can choose a good attitude, or a bad attitude. It is up to us. What is attitude? What does a positive attitude look like? What is it for? All of those answers can be found in this special blog post here. All Tiny Tiger and Karate Kid Students >> Songahm 2. Tiny Tigers do first half of form (moves 1-12) and one-step #1. Karate Kids complete the entire form and BOTH one-steps. Single Ssahng Jeol Bong Weapon Form >> Tiny Tigers perform weapons freestyle of their choice. Karate Kid beginners perform first half, Intermediate and Advanced students complete the entire form. Board break >> (intermediate and advanced students only): Round kick using ball of foot (the bottom), not the top of the foot (instep). Also, for the first time, the single ssahng jeol bahng form will be demonstrated at testing. Beginners will show the first half (before the turn), intermediates and advanced students will show the entire form. This will help prepare us for competing with a weapons form at the Twin Cities Regional Tournament in Shakopee in March, 2019. Mark your calendars, our next testing held at Pershing Park Recreation Center at 6pm on February 13, 2019 at Pershing Rec Center. Mr. Ben O’Brien (pictured right) competes at the ATA Fargo Tournament, August 2018. 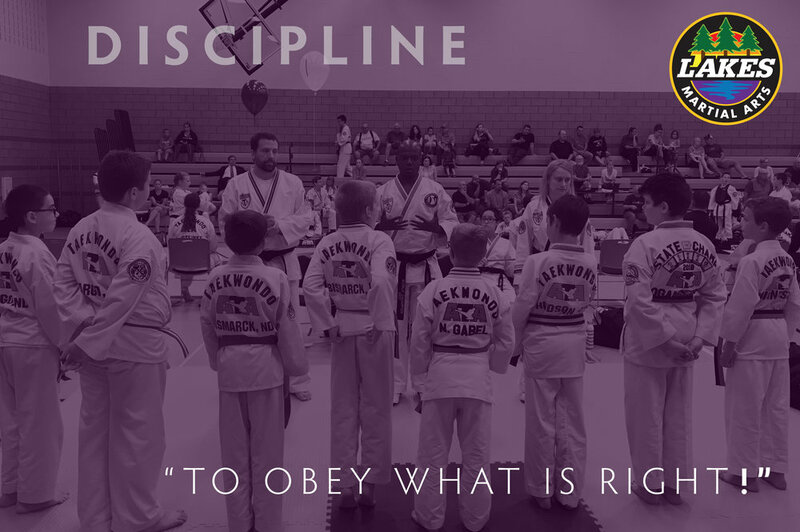 Defining DISCIPLINE: To obey what is right. This means to practice good habits. But, what are good habits? Simply put: they are behaviors that make us better people. This Fall 2018 session at Lakes Martial Arts we will be talking about DISCIPLINE. It all begins with obedience. When we are children, we must obey our parents, teachers, and mentors. They are the ones responsible to show us the right path. Later in life, we must learn to rely on our self-discipline. It’s when we no longer need to be told what to do, or how to do it. We need to be disciplined with self-control… controlling our emotions, rather than have them control us. Punctuality. Being on time. Disciplined people are punctual and have the ability to use time to their advantage. Goals. Disciplined people are driven by their goals. Focus. Disciplined people focus on what is most important. These are the topics we will be focusing on this session! Beginner Students >> Songahm 1. Tiny Tigers do first half of form (moves 1-9) and one-step #1. Mark your calendars, our next testing held at Pershing Park Recreation Center at 6pm on November 14, 2018. "Communication is the bridge between me and the world," we've been reciting each class this session. This session we'll be talking about the importance of communication. As Lee Iacocca once said, "You can have brilliant ideas, but if you can't get them across, your ideas won't get you anywhere." This wisdom comes from the man instrumental in the introduction of the Ford Mustang! What are keys to effective communication? How can we communicate through our body language. How might we demonstrate respect in good communication? These are among the topics Tiny Tigers and Karate Kids (and adults) will be honing this session in class and at home and school. Beginner Students >> Sohngham 1. Tiny Tigers do first half of form (moves 1-9) and one-step #1. Intermediate and Advanced Students >> Sohngham 4. Mark your calendars for our next testing held at Pershing Park Recreation Center at 6pm on June 27, 2018. Mr. Haynes (pictured) led a sparring clinic at Iowa Camp recently with Mr. Kern, Mr. Just (pictured, middle), and Mr. Gonzalez. All returned from camp with new training tips to share! This session we will be focusing on excellence and in preparation for the upcoming Twin Cities tournament held on March 24, 2018 at Shakopee High School. 1. Register for the tournament here >> All details may be found on ATA's website. 2. Material for this session. We will be reviewing the some of the same material we presented last session, only focusing on quality of technique (starting position and ending position), focus, and excellence in demonstrating a positive attitude. Beginners (White - Yellow): Songham 3, second half, one-step #2: CLICK HERE TO DOWNLOAD PDF. Beginners (White - Yellow): Songham 3, both one steps CLICK HERE TO DOWNLOAD PDF. Intermediate (Camo - Purple): Choong Jung 1 (goal: entire form) CLICK HERE TO DOWNLOAD PDF. Advanced (Blue - Red): Choong Jung 1 (entire form) CLICK HERE TO DOWNLOAD PDF. • Complete 8 rounds (record lowest score from each round). Tiny tigers train only 4 rounds. Push yourself as hard as you can for 20 seconds and rest for 10 seconds. This is one set. You'll complete eight sets of each exercise. Start with Front kicks. Perform them for 20 seconds at a high-intensity. Rest for 10 seconds, then go back to doing front kicks for 20 seconds. Once you complete eight sets of front kicks, rest for one minute. Write down the number of your lowest score. Next, move on to clapping jumping jacks and repeat the sequence of 20 seconds on, 10 seconds off. Once you finish eight sets of jumping jacks, rest for one minute, and then finish the workout with alternating lunges squats. Score will be combined LOWEST score from each of the three movements. 4. SUMMER CAMP. Mark your calendars for the very first summer camp offered by Lakes Martial Arts! Dates & time: August 20 - 24 from 9 a.m. - 3 p.m at the Pershing Recreation Center in Minneapolis. Check back here soon for registration link. Testing April 18, 2018 at the Pershing Recreation Center at 6:00 p.m. ALL STUDENTS WILL TEST AT THIS TIME. Lots packed into this blog post! Instead of setting "New Year's Resolutions," respect yourself and think up one or two words to focus on for the year. Try it and you may surprise yourself. Bully Prevention Seminar held Saturday, January 27 from noon - 2pm at Pershing Rec Center. Free. Ages 6 - 13 (or with instructors permission). Beginners (White - Yellow): Songham 3, first half, one-step #1: CLICK HERE TO DOWNLOAD PDF. Intermediate (Camo - Purple): Choong Jung 1 (1st half, moves 1- 22) CLICK HERE TO DOWNLOAD PDF. Start with push-ups. Perform them for 20 seconds at a high-intensity. Rest for 10 seconds, then go back to doing push-ups for 20 seconds. Once you complete eight sets of push-ups, rest for one minute. Write down the number of your lowest score. Next, move on to butterfly sit-ups and repeat the sequence of 20 seconds on, 10 seconds off. Once you finish eight sets of sit-ups, rest for one minute, and then finish the workout with air squats. Testing Feb 7, 2018 at Pershing Rec Center at 6:00 p.m. ALL STUDENTS WILL TEST AT THIS TIME. Congrats to Tiny Tiger "Ben" for demonstrated courage to participate in the Souix Falls ATA Tournament this session! Doing your best is not easy for everyone, especially in front of a crowd! Parents sheets are available for the Fall 2018 session as were handed out that last. If you missed out, HERE IS THE LINK TO DOWNLOAD. Persevering in the face of adversity. Expanding your horizons. Trying new things. Raise your hand confidently when others in your class are too scared. Courageous people demonstrate confidence and a positive mental attitude. Courageous people make decisions without endless back-and-forth. Trust yourself! Making what might seem impossible today, possible tomorrow. Speak up-respectfully when something doesn’t feel right. 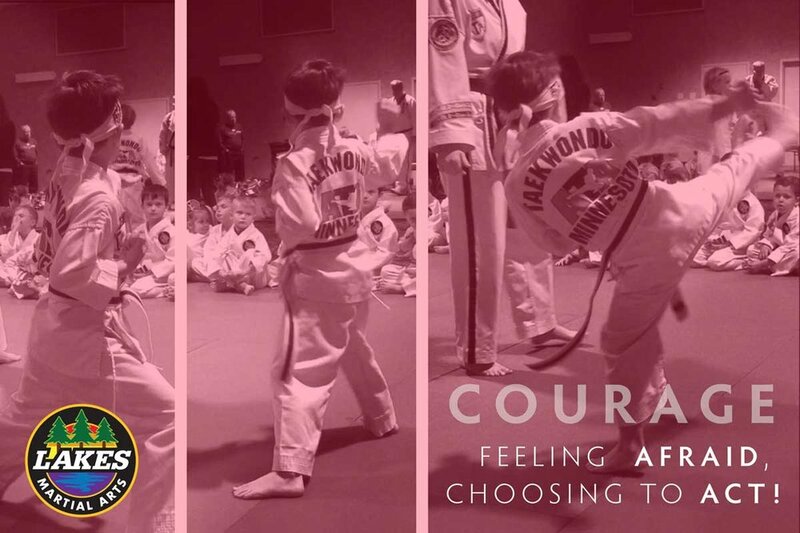 A remember, mark your calendars: the next color belt rank testing will be held Wednesday, November 18, 2018 at 5:30 pm Tiny Tigers and 6:30 pm for Karate Kids and Adults. Confidence is "Feeling fear, yet choosing to act!" This session at Lakes Martial Arts we will be talking about demonstrating confidence, both on and off the mat. “Courage doesn't always roar. Sometimes courage is the little voice at the end of the day that says I'll try again tomorrow," said author Mary Anne Radmacher. 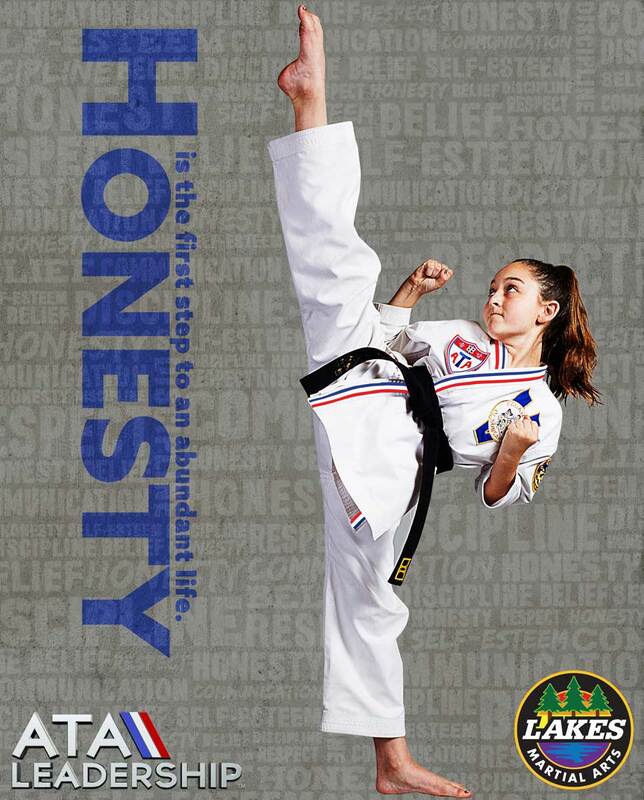 How does a martial artist demonstrate courage in life? Down to details: Testing will be November 15, 2017 at 5:30 p.m. Tiny Tigers, 6:30 p.m. Karate Kids and Adults. Pershing Recreation Center. Beginners >> Songahm 2 Tiny Tigers do only first half of form (moves 1-12) and one-step #1. Karate Kids and Adults do entire form and one-steps #1 and #2. Color belt board break is step up hook-kick. Bruce Lee once said, "A goal is not always meant to be reached; it often serves simply as something to aim for." What is YOUR goal this session? Without proper focus, there is no aim. This session we will be talking about focus as it relates to martial arts and life. A great big sail on a boat still needs a rudder to go places. That is where focus becomes important. Focus is like a rudder on a boat. Without it, you will just travel in circles! What will YOU focus on this session? Competing at a tournament. Breaking a board on the first try? Doing your form by yourself? These are all things we will think about this session, starting with our Smart Sheet handed out in class. Down to details: Testing will be April 19, 2017 at 5:30 p.m. Tiny Tigers, 6:30 p.m. Karate Kids and Adults. Pershing Recreation Center. Beginners >> Songahm 3 Tiny Tigers do only first half of form (moves 1-14) and one-step #1. Karate Kids and Adults do entire form and one-steps #1 and #2. Intermediate & Advanced >> Songahm 5. Karate Kids and adults must complete entire form (beginners must also demonstrate both one-steps). Color belt board break is step reverse sidekick. Stay focused on those goals and see you on the mat! I am very excited to introduce a brand new component to our program that will become a staple to our life skills program: The Smart Sheet, a goal map for your student. Allow your child to decide that he/she would like to work toward the goal. This will make the process more meaningful and likely to work toward those goals. The student will be recognized for their Smart Sheet Goals in class (belt stripes will not serve as the goal for the Smart Sheet). However, if parents feel the student deserves praise for extenuating circumstances, please notify Mr. Kern at least 2 weeks prior to testing (special arrangements at testing will be made). Ideally, the goal date should be within the current session. Below, I have provided an example of a SMART Sheet that has been completed to give parents and students an idea of what to expect. Be creative, but be specific! Good luck! As Winne-The-Pooh would say, "You're braver than you believe, stronger than you seem, and smarter than you think!" Stay strong! Self-esteem and attitude go hand and hand. In this next session, students will be encouraged to "Stay Strong" in life, both on and off the mat. "Being honest with yourself" will be an important theme discussed over the next 10 weeks, especially at it relates to trying your best. Welcome to the Fall 2016 session! We kicked off our first class this week with over 30 new students this session! 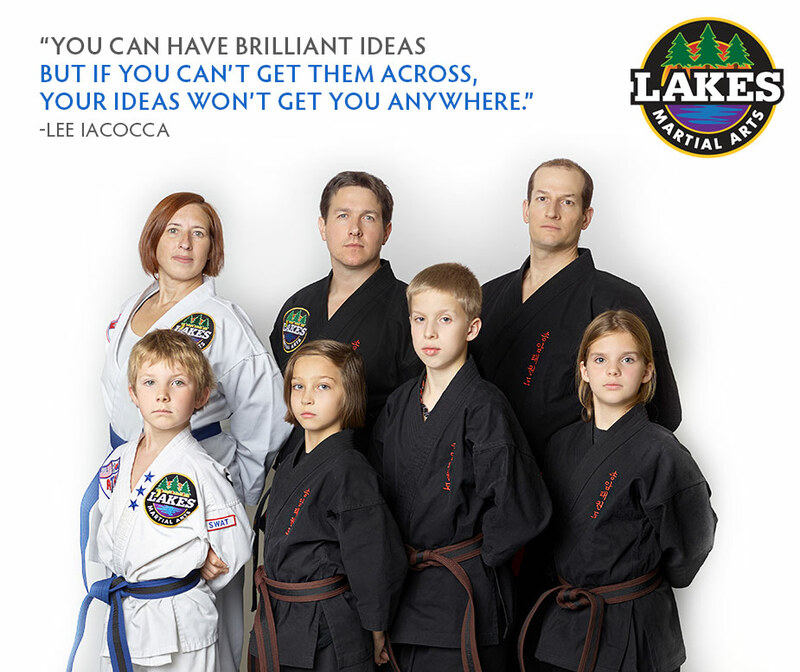 I am excited about the growth and enthusiasm at Lakes Martial Arts and foresee great potential during our 4th season! This session we will be talking about confidence and attitude as part of our life skills program. Please help us reinforce these ideas during practicing at home... remember the three pine trees on our patch represents the triangle of learning between the parent(s), student, and Instructor. • Confidence is the feeling you can do something and believe in yourself no matter what. • Self-confidence gives you the ability to finish what you started. • Good eye contact, firm hand shake, high/strong/fast kick & hand techniques, loud yell, willingness to participate, demonstrate, answer questions. • To have good relations with others, to defend against criticism, to stay positive through hard times, and to make your family proud. During week 3 we will be testing for our first stripe. Beginners - Songahm 1 Form HERE Tiny Tigers do first half of form (moves 1-9) and one-step #1. My Body Achieves What My Mind Believes! Sylvi competes at her first tournament as a red belt, completing a requirement to become a black belt. 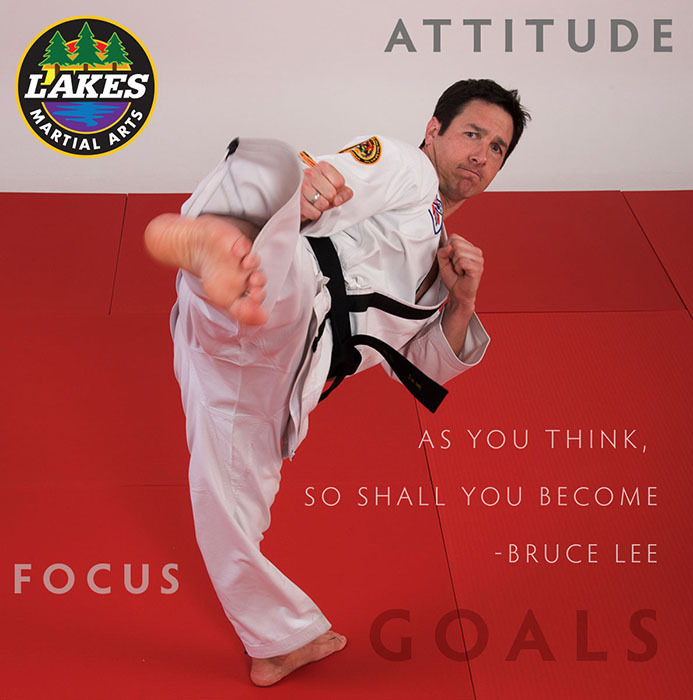 "My body achieves what my mind believes," will become an important motto heard and practiced during the Summer 2016 session at Lakes Martial Arts in Minneapolis. If we train our mind, our body becomes stronger. And smarter. And healthier. What's the weakest part of the body? By focusing on our goals, we can improve what we set our mind to. Higher kicks, doing our best in school, listening to our parents, smashing a board at our black belt testing... all of these require us to focus on our goals! The Tiny Tigers must complete the first half of the form (moves #1 - #14) and the first one-step self-defense moves, while the Karate Kids & Adults must complete the entire form and both one-steps. For extra credit, DOWNLOAD THE PARENT SHEET HERE.